It has been exactly 2 months since Yolanda (Haiyan) struck, and today, 8 January 2014, our leaders again set out on mission, this time to solidify the plans for Gawad Kalinga’s massive reconstruction work for the typhoon survivors. I checked my 2013 calendar, looked at my 2012, and then it dawned on me – this really has become the norm every year, with one disaster after another raging through our country. In 2009 it was Ondoy (Ketsana) in Metro Manila; in 2010 it was Juan (Megi) in North Luzon; in 2011 it was Sendong (Washi) in Mindanao and in 2012, it was Habagat in Metro Manila and Pablo (Bopha) in Mindanao. Then in 2013, one after another it hit us almost like a plague – Typhoons Maring (Trami) and Santi (Sari) in Luzon, the wars in Zamboanga, the killer quake in Bohol and the last straw was Supertyphoon Yolanda (Haiyan), unleashing a fury like the world had never seen before with an intensity and magnitude that quite literally blew away almost the whole of the Visayas islands. 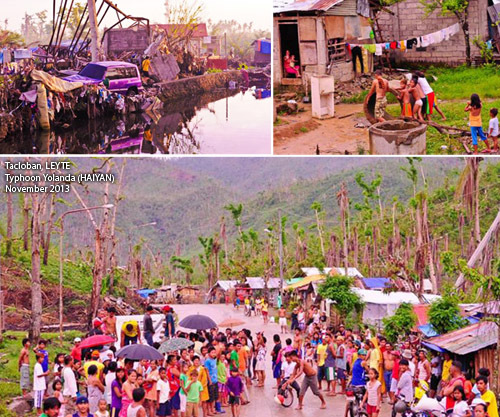 This left us down on our knees in prayer, but also on our hands and feet working almost 24/7 to reach out to the disaster victims that desperately needed our help, as we continued to help the rest of our countrymen who are victims of the biggest silent tragedy of our country – that of immense poverty. Because while Yolanda took 6,183 lives (Source: NDRMCC Update as of January 8) in the 4 days that it pummeled through the countryside, millions of our fellowmen continue to live in extreme poverty, with barely anything to eat and no decent shelter to call home. Who knows how many lives poverty claims every single day? The needs of the Yolanda survivors are urgent, yet we have learned that the needs of the millions who live in danger zones are not any less urgent. And as the dark cloud of climate change threatens our country, we know that these vulnerable families are next in line as victims. Unfortunately for us, there’s no way of telling where the next disaster will strike and claim lives. When disasters strike, the poor are the most vulnerable. 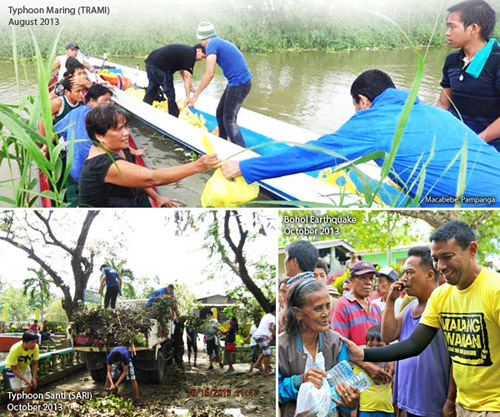 So even as our ground teams in the Visayas went into a frenzy distributing relief goods to the most far-flung areas, teams in the rest of the country were also doing their part. In Metro Manila and Luzon, teams were working all throughout the year getting people out of danger zones and relocating them to safe communities. >> Read more in "Teleperformance: Building Homes, Building Lasting Friendships"
>> Read more about GK Silver Heights in "Turning Over a New Leaf"
Mindanao was equally busy completing commitments for survivors of both Sendong and Pablo, and GK together with our strategic partners have turned over an astounding 1,500++ number of homes – the proud, silent work of the past 2 years. When others seem to have ended their work in these areas given other priorities, we have not stopped and will not stop until the work is completed. Even beyond just rebuilding homes, the serious work of rebuilding lives by getting the children to school, providing livelihood opportunities and building community spirit continues. It is a long road ahead still, but they are on track and we are confident that they are on their way out of poverty, perhaps very slowly but surely. 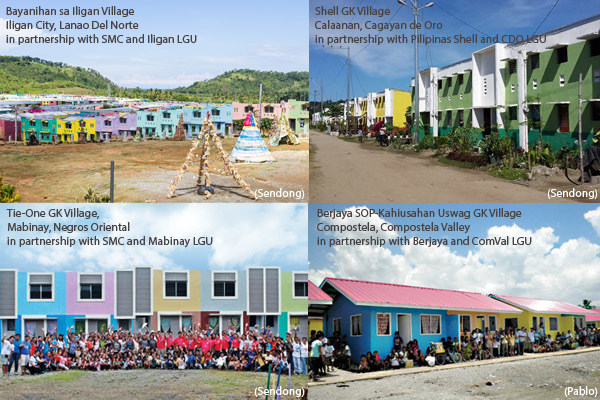 >> Read more about Iligan in "SMC and GK: Building Hope That Lasts"
>> Read more about Compostela Valley in "Hope is the New Normal"
This just affirms GK’s guiding principle that it’s about people, not programs. As it turns out, beyond building sturdy homes, it is this community spirit that has proven to be the most important, life-saving aspect of our work. 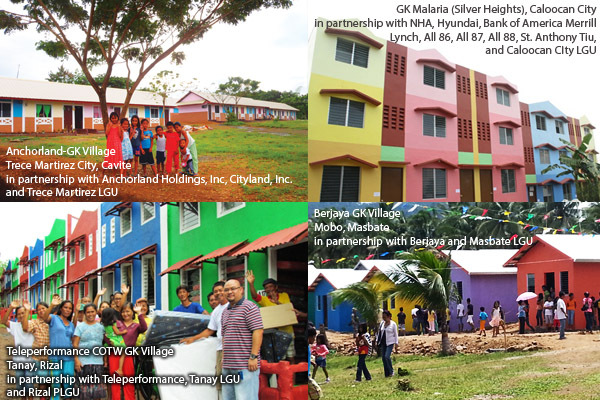 No doubt that we can design and build houses that are as "disaster-resilient" as can be, but as for GK, we greatly consider the multitude who need the homes and the resources that are limited. What we know for sure is we can prepare not just with infrastructure but by building PEOPLE and COMMUNITIES that are disaster-resilient. This means helping make sure that they are organized, empowered and most importantly, will not leave anyone in their community behind. One big miracle that we thank the Lord for is that in all the 41 GK communities that were hit by Yolanda, there was ZERO loss of lives. Roofs were blown away, some homes were torn down but ALL residents, young and old, are alive and accounted for. And the community spirit after the storm is stronger than ever. THIS is the work of GK. 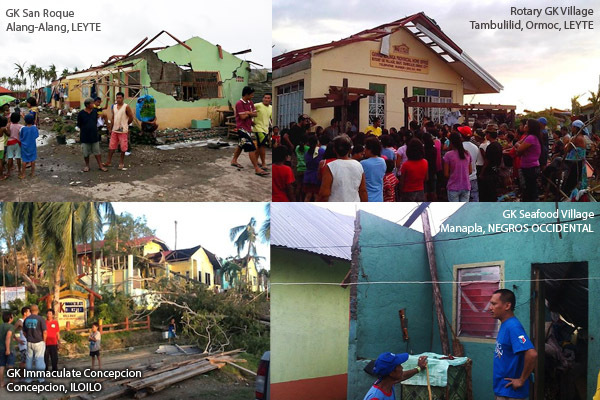 In all the 41 GK communities hit by Yolanda, roofs were blown away, some homes were torn down but by God's grace, ALL residents are alive and accounted for. And their community spirit is now stronger than ever. As soon as it was safe for our volunteers to travel to the hard-hit areas a day after Yolanda struck, our GK communities became the first command centers and our residents the first service teams. 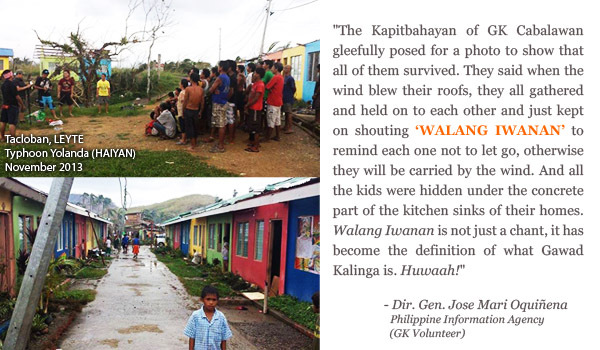 They pointed us to the barangays that were isolated and most affected. Because of the seeds we planted all these years, we had the most widespread network, ready to respond and distribute ~100,000 food packs in ~220 barangays in just 40 days. During the GK anniversary last October, I was asking the Lord to show us what the past 10 years have been about. Yolanda was the answer. 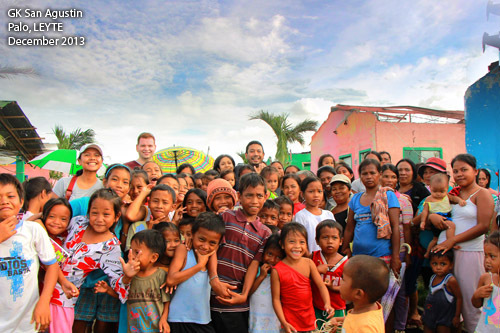 The Lord prepared us for the past 10 years so we could respond to the biggest storm ever recorded in history – with the largest missionary spirit and BAYANIHAN the world has ever seen. This is best exemplified in the extraordinary hearts that responded, risking life and limb to bring tiny sparks of hope during one of the darkest moments in our country’s history. And you were part of that tiny spark, the ember that refused to die even when tragedy after tragedy attempted to put out the flame. That donation, your compelling Facebook post that spoke in behalf of those that could not be heard, the simpler presents and celebrations so that we could share Christmas, the volunteer work to bring relief packs with notes of encouragement to the victims. Whatever it was and is that you did and continue to do for our fellow Filipinos who suffered, I want you to know that your act of caring and sharing has made a difference. We all made the difference. More than a foundation, Gawad Kalinga is our sacred oath and commitment to give care. We must carry out this mission in our homes, in our communities, in our country until caring and sharing becomes our new normal, so much a part of who we are and what we do that our collective flame completely overpowers the darkness and poverty that has enveloped our nation. Are you ready for a year of mission? So are we. Let’s forge ahead with renewed fervor and unyielding hope. Walang iwanan!